October 21st, 2018 will continue to be a day to remember always in the life of Alhaji Fatai Adesina Kolawole, the Permanent Secretary, State Universal Basic Education Board, Osun State, including his immediate and extended family, colleagues at work, friends of decades and political associates among many other well wishers who trooped in en-mass for the book lunch. 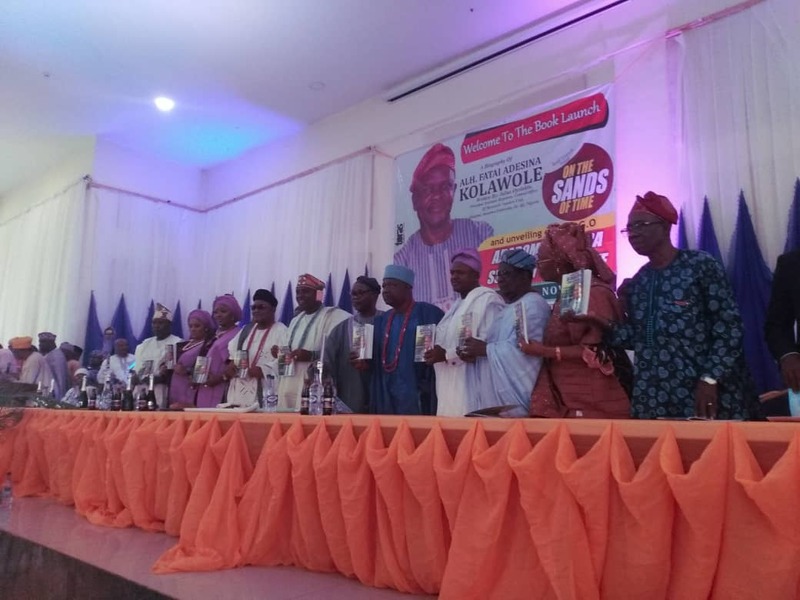 The venue of the event, Aurora Conference and Event centre was filled to capacity as dignitaries from all walks of life including traditional rulers both within and outside the state was in attendance. Among them were Distinguished Senator Babajide Omoworare, Senator representing Osun East Senatorial district in the national assembly, Chief Sooko Adeleke Adewoyin, former deputy governor of Osun State representative of Governor Rauf Aregbesola, who was ably represented by Mr. Omotunde Young, representative of the Governor Elect, Alhaji Isiaka Adegboyega Oyetola, former deputy governor of Ekiti State, Prof. Mrs Modupe Adelabu who was represented by Prof. Oyinloye, representative of Chief of Staff, Hon. Salinsile, Secretary to the State Government, who also doubled as the Head of Service, Dr. Oyebade Olowogboyega, top hierarchies and leaders of APC in the State, Professor Y.K Yusuf, former dean, faculty of Arts, Obafemi Awolowo University, Ile-Ife who edited the book, Mr. Julius Oyelakin, the author of the book, Otunba Abiola Oloke and the caucus of Osun State House of Assembly members led by Hon. Folorunso Oladoyin Bamisayemi among other personalities of high repute. Besides, first class Obas in the State were also in attendance among them Ooni of Ife, Ooni Adeyeye Enitan Ogunwusi who was represented by Onimolodo of Ile-Ife, Ataoja of Osogbo, Oba Jimoh Oyetunji Olanipekun Laroye II, Akirun of Ikirun, Oba AbdulRauf Olayiwola Olawale Adedeji, Aragbiji of Iragbiji, Oba Rasheed Olabomi including his Oloris, Orangun of Oke-Ila, Oba Adedokun Abolarin, Elende of Eko-Ende, Oba AbdulRauf Olaniyan Ajiboye while Ogunsua in Council was represented by Oosa of Modakeke, Oba Kamorudeen Adeyemi Adeyanju of Olororuwo of Ororuwo was represented by Owa of Otan among many others. Other who were also present were the permanent secretaries, officials of local government education inspectorate officers and other civil servants from different MDAs. While addressiing journalists at the event, the SUBEB permanent Secretary in person of Alhaji Fatai Adesina Kolawole said the emergence of Ogbeni Rauf Aregbsola as the Governor of the State including his well thought out vision and his very rare approaches to governance and service delivery to the people of the state brought out the kind of person he is including thousands of other civil servants in the State. He therefore described Ogbeni Rauf Aregbesola as a great, brave, intelligent, dynamic, articulate and visionary individual. Delving a little into the book itself in page 141 when asked about his guiding principles as someone who is always ready to help others , Alhaji Kolawole states as follows "I can attribute my attitude to life to the Islamic faith that preaches moderation, the lifestyle of Prophet Mohammed (Salahu alayhi wa salaam) that showed practices extreme tolerance and hard work from my late father. " Above all, success and ability to impact on others is a gift from God", he concluded. The book launch came to an end with the cutting of cake, entertainment of audience and music.